Ah - Halloween special editions! Change the colour of the icing! Add a spooky picture! At least that's what happens in the cake world. 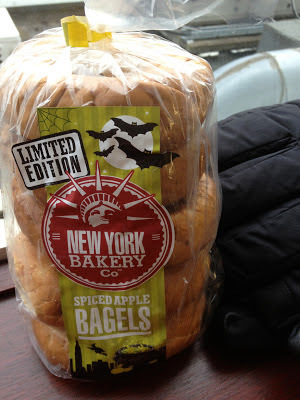 The New York Bakery Co. had other ideas which they claimed were more exciting so put some bagels in the post for me. As I love bagels this wasn't a particularly hard thing to say yes to! Spiced apple isn't the first flavour that comes to mind for Halloween (pumpkin bagels!) but we shall see. First up I tried them savoury - smoked ham should go very nicely with apple. 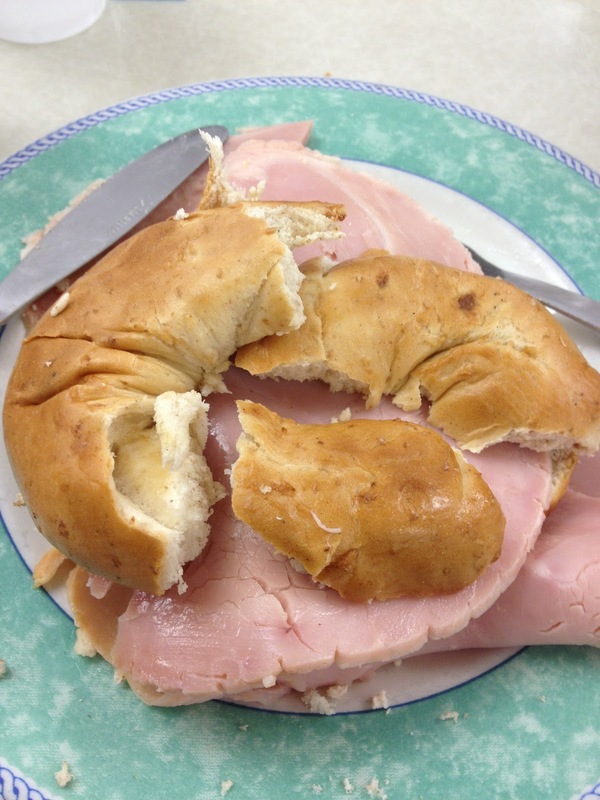 While the cutting up of the bagel wasn't perfect, the complement of flavours was. The apple (and maybe cinnamon I think) worked well, there were little pockets of goo within the bagel itself which added to the experience. Verdict - a success! Next up I tried them toasted. You can see the little meteor marks from the apple all crisped up from the toaster. This is a good thing. The flavours were maybe even stronger after toasting than eating soft. Another tasty victory for the bagel. The bag says these are limited edition, but hopefully they will pop a reindeer on the bag and sell these for Christmas too - heck they could put the Easter Bunny on these and I'd still buy them. I'm not a fan of sultana/raisin bagels so miss out on most of the spicy and interesting themes that they do, but these are right up my street - will actively hunt out and buy again. These look brilliant. My husband is completely raisin phobic so sweet bagels are usually a no-go for him. Do you know where these are available to buy? Good lord, where can these be bought?